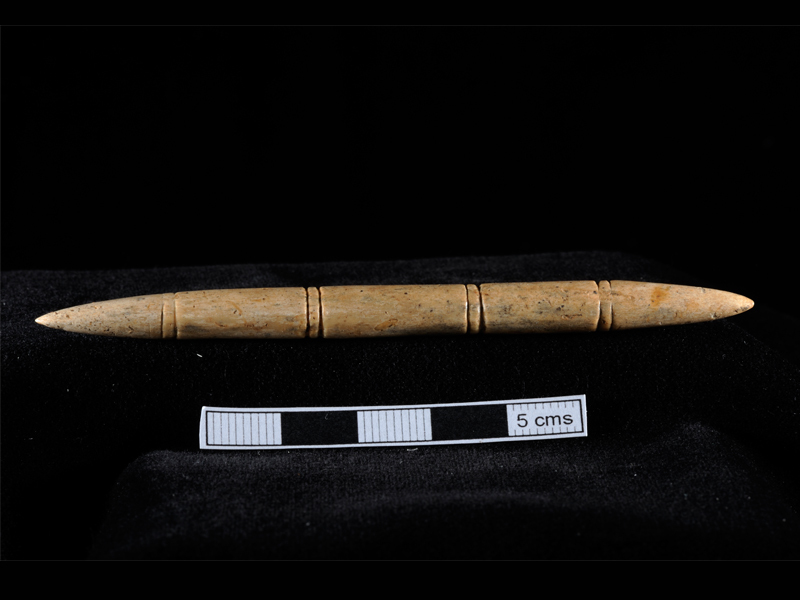 Anglo Saxon pin beater made of animal bone. Cheltenham, Gloucestershire, 400-800 AD. Courtesy of Cotswold Archaeology. I attended Dress and Textiles III: Texts and Techniques at KZOO and devoted my last post to one of the speakers, Courtney Hess-Dragovich’s talk, about Venetian beauty ideals in, Dyes, Diets and Deodorants: Venetian Beauty Secrets Revealed. There were 2 other papers in that session that were also excellent and I didn’t want to overlook them. If you’re a fashion fan or remotely interested in medieval and early modern textiles, then this was your session. Hosted by DISTAFF (Discussion, Interpretation and Study of Textile Arts, Fabrics and Fashion), this was an intriguing set of papers given to a packed house on Anglo Saxon weaving, and Early Modern men’s clothing. First up, we had, A Weaving Tool? An Examination of Pin Beaters in Anglo Saxon England. This paper talked about Anglo Saxon pin beaters, tools that were used in loom cloth weaving during the Middle Ages. Or were they? That was the question posed by Christina Petty (University of Manchester). Were these tools actually used in weaving during the Middle Ages? She seemed to think they may not have been weaving tools. So what exactly is a pin beater? It was a tool between 8-21cm (3-8 inches) long, and could be either single or double ended. There were 2 types of looms used for weaving during the Middle Ages: the warped weighted loom (weaved upwards) was used until 900 when it was replaced by the two-beam loom (weaved downwards). They both had pin beaters, which were considered necessary for cloth creation. Single ended pin beaters were used with the two beam loom and double ended pin beaters with the warp weighted loom. Petty mentioned an interesting fact about her finds: In Ireland, both single and double ended pin beaters have been found but no warp weighted loom remnants were found alongside them. Petty looked at art, archaeology, and basic common sense to determine if these tools were actually used for weaving, since she weaves on these looms. She found samples of pin beaters in grave markers supporting her ideas, unfortunately, when it came to art, there were very few pieces that depicted pins and looms until 1700. When pin beaters were first discovered by archaeologists, they assumed these were hair pieces but they have since been properly recategorized. The first pin beater was found in Kent on September 30, 1773. Petty examined many pin beaters from various museums around the world and found many of them had divots carved into them but they appear to serve no purpose for weaving, therefore, she does not think they were medieval weaver’s tools. The jury is still as to what the divots mean and, what these tools were actually used for, if not for weaving? I guess we might have to wait until next May’s KZOO to find out! Until then, it presents some interesting material to chew on for historical weavers. The final paper of this set was given by designer, tailor, and author, Matthew Gnagy (Parsons University of Fashion Design, New York) on tailoring in the early 17th century. Gnagy works in the New York fashion industry, and as a theatrical tailor for film and stage. He got his start in tailoring at the age of 17, and nurtured an interest in historical dress. Tailoring is a very old trade. A tailor is different from a seamstress in that he or she sculpts the fabric. To better understand the process of tailoring, he looked at several surviving Spanish Tailor’s Manuals: The 1580 book by Juan de Alcega, The Practice of Tailoring, Measuring and Marking Out 1588, and Francisco de la Rocha Burgen’s 1618 work, Gemetria y Traça. He read these books and then translated them into modern Spanish and turned them into ‘tailor speak’. Master Tailor, Juan de Alcega, 1580. Gnagy’s paper, The Manipulated Plane: Modern Tailoring Practices in the Early 17th c. Menswear, detailed the tricks used in this Early Modern era to create well made doublets. He noted that “Sculpted tailoring is largely invisible to the untrained eye” and discussed common manipulations in the men’s doublet such as the shoulder seam, armhole and neckline manipulation. Shoulder seam manipulation appears to have been used hundreds of years ago even though most fashion students have been taught that this technique wasn’t used until the 18th century. Gnagy’s findings in the above mentioned 16th and 17th century Spanish texts show that this wasn’t the case. The paper was peppered with examples from Early Modern art and Gnagy’s own historical creations. He demonstrated sloppy work vs. these invisible manipulations that were so slight, yet completely transformed the clothing. It was a fascinating paper.